Gary Coleman, who soared to fame in the late 1970s as the child star of the hit sitcom "Diff'rent Strokes" and whose post-TV-series life included a stint as a shopping mall security guard and an unlikely run for California governor, died Friday. He was 42. The diminutive Coleman, whose adult height was 4 feet 8 inches, died at Utah Valley Regional Medical Center in Provo after suffering a brain hemorrhage earlier this week, according to a statement from hospital spokeswoman Janet Frank. 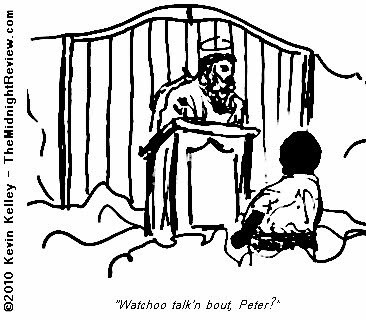 I figured as tribute I would illustrate an obligatory "St. Peter's Gate" cartoon for the actor, whom I had fond memories of watching on television as I grew up.